The below information was organized and submitted to ComcastGeorge by CCCarole, Joel, JR0171702. Please send them your thanks for their hard work and dedication by clicking on the KUDOS button next to each of their posts below. These are the instructions for getting Outlook, Outlook Express, and Windows Mail to work properly on your PC. Also note the instructions further below for Mozzila’s Thunderbird and a link for Mac Configurations. Also note the instructions further below for Mozzila’s Thunderbird,a link for Mac Configurations, and a link to download, install, and configure Windows LIVE Mail. NOTE: You can no longer use Port 25 for SMTP (Outgoing server) You must use the settings listed here. Comcast supports Xfinity Connect webmail and industry standard POP3. 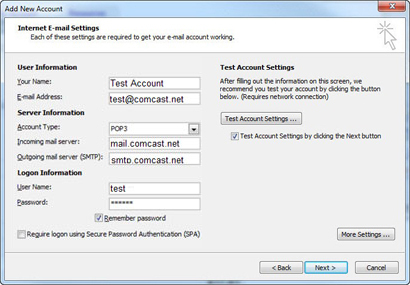 For you, this means you can access your email on Xfinity Connect via a web browser from www.comcast.net , or you can use any of the large variety of pop clients available to you such as Outlook Express and Mac Mail. 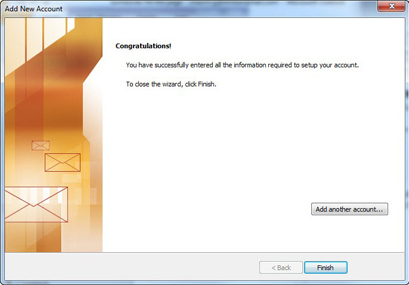 Comcast offers official support for Outlook Express 6.0 and higher, Windows Mail and Mac Mail. 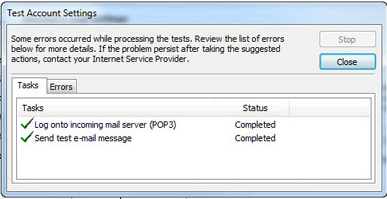 However, most pop3 clients will work with the Comcast email service. Note: With Windows Live Mail - Leave the box ticked which says, "clear text authentication"
Turn off whatever email scanning your anti-virus package is doing. Comcast already scans incoming email for viruses, and your outgoing email isn’t going to be infected unless your machine is already infected, so there’s no point checking it all the time. 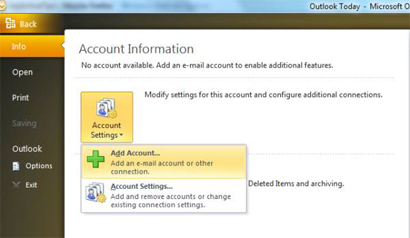 3.choose "View or change existing e-mail account"
Exit from Outlook, then make sure it isn't still running in the background. Hit CTRL-ALT-DEL, go to the Processes tab, and kill any occurrences of OUTLOOK.EXE before launching Outlook again. Click the Office button located in the left most corner. Under the Info category you will see Account Settings. Click the drop down button and choose Add Account. Check the Manually configure server settings or additional server types radio button and click Next. Select Internet Email then click Next. Fill in all fields for User, Server, and Logon information. 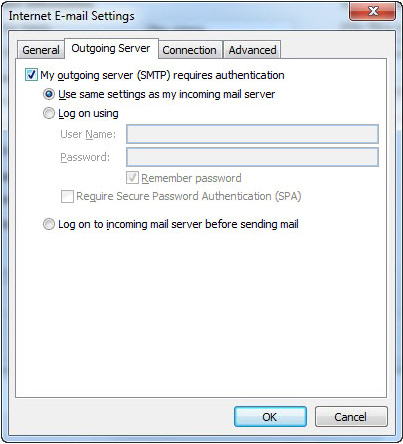 In the Outgoing Server tab, check the box marked My outgoing server (SMTP) requires authentication and ensure the Use same settings as my incoming mail server is selected. In the Advanced Tab change the Incoming Server (POP3) to port 110 and make sure the box next to 'This server requires an encrypted connection (SSL)' is NOT checked. 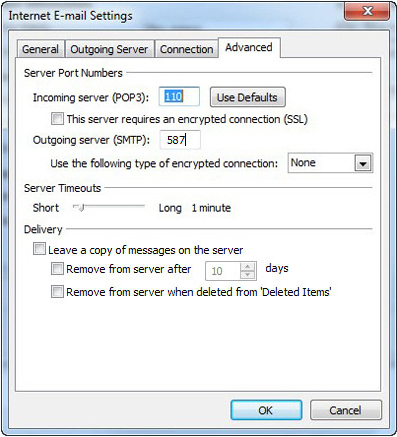 Change the Outgoing Server (SMTP) to port 587 and change 'Use this following type of encrypted connection' to None then click OK. 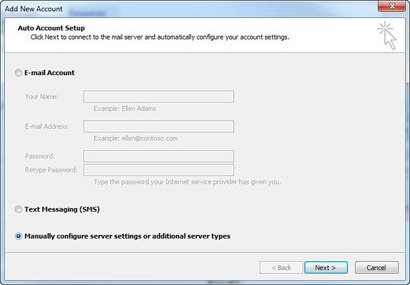 Check the settings by clicking Test Account Settings on the Internet Email Settings screen. When test completes click Close. This is a clickable link to the Macintosh Forum with detailed information about configuring your email using a Mac. Please download attachment in post for offline viewing. 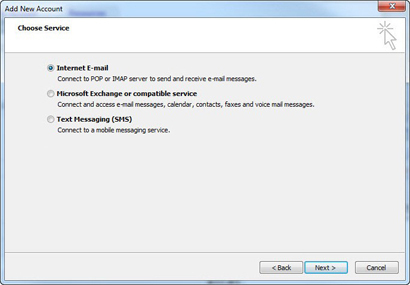 The Windows Live Mail link includes links to the download, as well as directions for configuring 'Windows Live Mail' which is different than the directions for configuring 'Windows mail'. The below is a graphical image of the email settings. Also, please list any error messages that you are receiving. Also works for SeaMonkey v2.16 Thank You. 13) Now test out receiving and sending emails. Make changes as necessary to your scenario.